'Everybody knows about Darwin's theory of evolution and that an apple fell on Isaac Newton's head. But did you know that Galileo went to prison just for saying the earth moves, and that Marie Curie hated being horribly famous? This book is an instalment to the Dead Famous series now re branded as Horribly Famous on the life of nine well known scientists whose contributions have shaped the world as we know it today. These include Aristotle, Galileo Galilei, Isaac Newton, Michael Faraday, Charles Darwin, Gregor Johann Mendel, Louis Pasteur, Marie Curie and Albert Einstein. 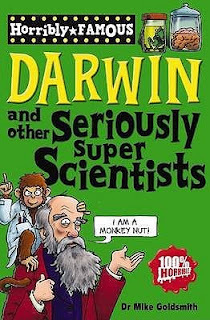 Despite the title of the book, Darwin is given only as much importance as the other eight scientists in the book and the book is not substantially about him, rather, just about twenty pages. This book met the expectations that I usually have in a Horrible Histories book, good illustrations, pulling out unknown facts about the subject they're dealing with, the imaginary personal diary, among others. I am someone fascinated by science but not someone who loves science as I was never able to get a hang of it but then, I have an admiration for those who did, be it Charles Darwin or Albert Einstein. So, I could get a broad idea of how these scientists arrived at their path breaking discoveries and at the same time, their path to doing it, college life, personal life, was also covered. I also loved those boxes - Secrets of Science inserted at regular intervals during the course of the book presenting certain interesting facts. I also felt the author chose well known scientists, ideal for a children's book and yes, one problem with this series is that it hardly moves out of the UK and hence, I appreciate the fact that the author has chosen great scientists also from places other than the UK. At times I wondered as to why the author chose Charles Darwin as the flagship scientist for the book but as I analysed what he was conveying, he very clearly seemed against the religious establishment and it was Darwin who shook the very foundations of their reasoning and perhaps, the respect is out of that. This book is going to disappoint a kid highly enthusiastic about science and wishes to know the deeper aspects about the research about the scientists whom they adore. However, if they just want to decide on whom their role model is, this book could still serve the purpose. Apart from this, I don't have anything significantly negative to say about the book; maybe the author could have added a relatively obscure scientist which could have made the book interesting but that is more than a suggestion than a flaw. On the whole, I felt it was an excellent reading experience and I award the book a rating of seven on ten.